July is always one of the busiest months of the year for us. To begin with, our wedding anniversary is July 16th, and we always do something special to commemorate the day we exchanged vows. One of our favorite traditions is that we splurge and buy a box of juicy chevron dipped strawberries (chevron dipped means that they are covered with both dark and white chocolate—YUM!) because these covered the top of our groom’s cake when we got married. Our good friend Val O’Dell made our cakes, and they were gorgeous with a basket weave design that took her countless hours to perfect. 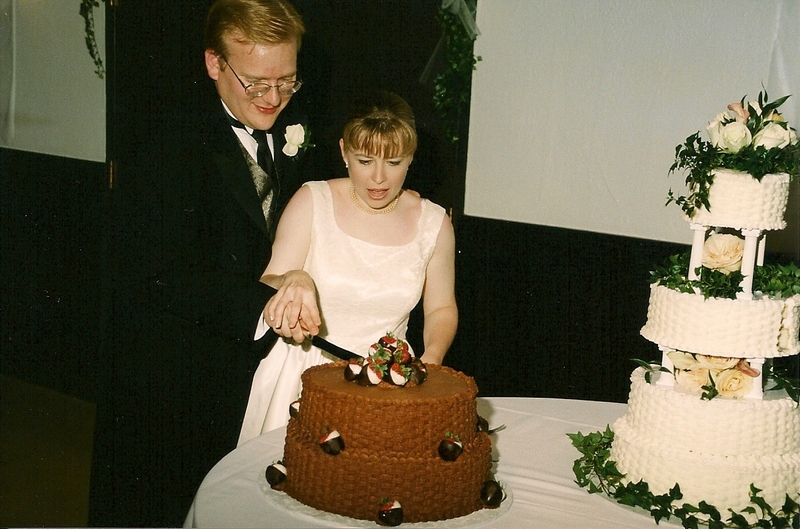 We’d looked forward to eating the cake that day with great anticipation, and yet the chocolate strawberries were the only part of it that we were able to eat! As you can tell from the picture shown here, they were to die for. Tell us what some of your wedding anniversary traditions are here. If you would like to view some of our other wedding photos, check out our new photo gallery. This month is also the time we take our summer vacation. What will you do this month? Are you going to travel or have a “stay-cation” as many are doing this year? Since money is tight for everyone, we’re going to investigate inexpensive and free things to do with your family, then we’ll share our discoveries with you here. So stay tuned for money-saving vacation tips and reviews of the places we visit this month. If you have tips you’d like to share, send them our way as well. As some of you may have noticed, June was not an eventful time in our “test kitchen.” However, we did dish up some tasty recipes that you will want to serve, perhaps for your very own barbecues this month. Scoop up our chunky guacamole with Serrano peppers with your favorite tortilla chips or dollop it on top of a juicy burger! If you love hummus, you’ll definitely want to try our simple and delicious recipe that goes great with our refreshing Israeli salad. And, if you want a sweet treat with breakfast, be sure to spread a little tropical sunshine on your toast with our homemade pineapple jam. We’re also adding a Shopping section to our site. Here we will highlight companies we’ve done business with over the years who have not only delivered great products and customer service, but they do so consistently! New vendors are being added regularly, so be sure to visit our new Shopping section often. Whatever you’re doing this month, we hope you find a great way to beat the heat, curl up with a good book, and enjoy time with friends and family. Have a safe and happy summer!